New Zealand was supposed to be where Pierre de Villiers would escape his past. A misadventure in Angola had cost him his faith in the military, and almost his life and sanity. Another event cost him his family. After a bizarre attempt on the Prime Minister s life De Villiers recognizes the arrow used is of Bushman origin. And suddenly he, now a policeman in Auckland, is a suspect. He must go back to South Africa for answers, and to face his demons. Can he unscramble his memory? Will he find the men who devastated his life? Recently South African lawyer Chris Marnewick's debut novel, SHEPHERD'S & BUTCHERS (2008), was adapted into an award-winning film starring Steve Coogan as a lawyer defending a death row prison guard who goes on a killing spree after participating in 32 hangings in a fortnight. Among other things, that extraordinary book, which blended fact and fiction and was shortlisted for the Commonwealth Writers Prize, introduced the character of Pierre de Villiers, a former soldier familiar with killing. In THE SOLDIER WHO SAID NO, Marnewick's second novel, de Villiers has moved to New Zealand (a shift Marnewick made himself), where he's serving as a police officer in Auckland, catching criminals and trying to move on from fractured memories of his traumatic past. But when an attempt is made on the life of the New Zealand Prime Minister, using an African weapon, de Villiers' past comes crashing violently into the present. The soldier turned policeman must delve deep into his own unsettling history to uncover the truth, and get justice. Legal or moral. Marnewick is a very interesting writer, one who packs his books with strong real-life threads, while delivering gripping fictional stories. 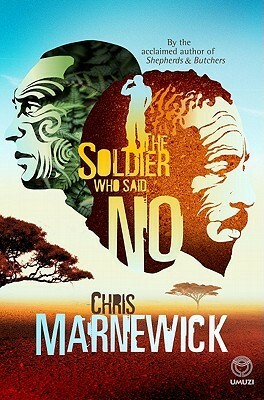 THE SOLDIER WHO SAID NO is more of a conventional thriller than his debut, but still retains a sense of asking some big social and moral questions. Pricking at uncomfortable topics, getting the reader wondering about more than just the story going on between its covers. It's not a 'breezy' tale, even if it's fast-paced and action-packed in parts. Candidly, it took me a little while to settle into this book - the author's style and de Villiers' perspective - but once I did I really enjoyed the read. Seeing New Zealand - often considered one of the more liberal, peaceful, and egalitarian countries in the world (relatively speaking) - through the jaded eyes of a man who fought for a racist regime is an unsettling, at times jarring, experience. Marnewick grew up and became a lawyer in a South Africa ruled by a racist Apartheid regime. In this tale he picks at racism lying beneath the multicultural veneer of modern New Zealand. De Villiers exhibits, witnesses, and suffers from racial prejudice. He's a brusque, tough man that's surprisingly (over)sensitive to things others may consider innocuous banter, perhaps due to lingering guilt for his own part in fighting for a racist regime. He's being eaten away inside, physically and emotionally. THE SOLDIER WHO SAID NO is a very good read that poses some fascinating moral questions, about its characters and the events in the tale, but also the wider world in which we live. It's the kind of story that gets you thinking, lingering with you far beyond the final page.